These are stories and essays from early America. I found it incredible that stories by Washington Irving, Edgar Alan Poe, and Henry James are sharing a book with essays written by Increase and Cotton Mather! While the supernatural elements of Irving, Poe, and James are products of imagination, the Mathers, father, and son, were deadly serious in their writings. On the words of Increase and Cotton Mather people could lose their freedom and even their life! My favorite story in this volume is the story of “The Devil and Tom Walker” by Washington Irving. There are several stories by Irving in the book, with “The Legend of Sleepy Hollow” given the honor of starting the volume. But it is the tale of Tom Walker’s deal with the devil that tops my list of favorite Irving tales! 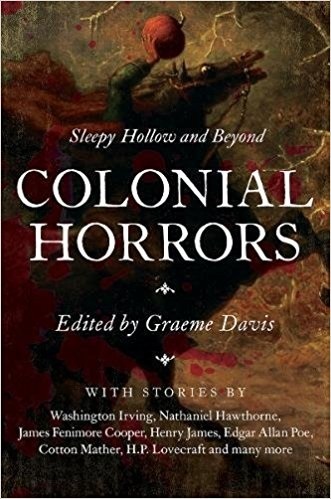 Other authors featured in this volume are Nathaniel Hawthorn, Charles Brockton Brown, an entire novel by John Neal, Rachel Dyer; James Fennimore Cooper, WF Mayer, Howard Pyle, and ends with an excerpt from “The Case of Charles Dexter Ward” by horror legend HP Lovecraft. The book also contains the true account of the infamous Bell Witch of Adams, TN. What I liked least in this volume was the poem “Moll Pitcher” by John Greenleaf Whittier. Whitter is known for his mastery of foot and meter, but in this case, he doesn’t hesitate to express in 15 words what he might have said in 6. The poem is extremely long winded and it just doesn’t excite me enough to enjoy plowing through 22 pages of stuffy poetry.